Sparkle Plenty Designs, Inc. specializes in promotional branding for promotional product distributors and suppliers - from corporations to small businesses, fundraisers to school pride -you name it! We'll help you with the creation of premium rhinestones, rhinestuds or genuine Swarovski crystal custom apparel & accessories, which we permanently apply to the garment/accessory of your choice. Sparkle Plenty's Crystal & Rhinestone Apparel Can: Enhance your brand image. Generate revenue through sales. Create your own walking & talking billboard (people love to chat about their team, cause, passion or business!) Maintain loyalty through a rewards program for key clientele = FREE advertising, AND it's much more affordable than you think, and given the choice, would you rather wear a flat looking print, or a stunning, high-quality bling shirt? How do I place an order? Retail orders can be placed directly from our site. If you have any questions, or are a wholesale client, please call us at 215.389.1877 or email info@sparkle-plenty.com. What is your minimum for a custom design? Custom crystal & rhinestone/rhinestone designs require a 15 piece min per design. Glitter has a 50 pc minimum. Will rhinestones stay on through wash & wear? 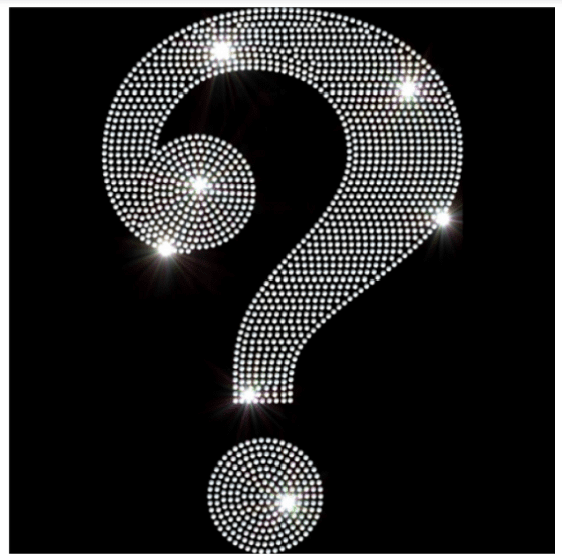 This is a question that comes up every once-in-awhile, either because someone is new to rhinestone apparel, was burned by an inferior product/company in the past, or tried their hand at home "bedazzling" with a lot of wasted time, wasted money and poor results. When it comes to our rhinestones, we at Sparkle Plenty Designs ONLY use premium stones -- no plastic or cheapie backings, and all rhinestone heat transfers are individually checked over before we professionally heat press the design onto a garment or item (tee, cap, tote, hoodie, etc.) Here's the deal -- with rhinestones, there are 2 primary considerations: 1. The quality of the stones 2. The quality of the application Quite simply, these 2 things make all the difference between a high quality, durable design application and the kind of questionable design work that makes people less than trusting about working with bling. (Trust us, we've seen some nightmares out there!) We have someone reviewing the backings of the stones of every design, looking for any questionable stones, and replacing them with good ones. We also re-align stones so they are positioned as they ought to be (especially important with certain shapes and text in particular...nobody wants crooked letters). This takes time from production but it ensures a level of quality that makes our product stand out and why we have a 5 Star ★★★★★ ASI rating. How do I care for my crystal or rhinestone tee? Just turn inside out, machine wash in cold or warm water. Gentle fluff dry or hang to dry. If ironing is needed, turn garment inside out and iron on low to medium heat. I own a heat press, do you create and sell transfers only? Yes, we do! Please contact us for details about heat press and iron-on designs. Is it safe to order online? We understand your security concern, which is why we use current industry-standard SSL encryption to transmit your credit card information securely over the Internet. What is your payment policy? We accept Mastercard, Visa, American Express and PayPal for retail sales. We also accept cashiers checks, money orders, business checks (after funds clear) for custom order. All custom orders require a 50% deposit with the balance required prior to shipment. I'd like to send a gift; is this possible? Yes - We will include a gift card with your personal message at no charge. Just choose that option when checking out. Do you offer gift certificates? Yes we do offer fabulous e-gift certificates! Now your gift recipients can shop almost instantly for their gifts! Do you offer volume discounts? Yes we do! Please call us at 215.389.1877 for specifics regarding custom orders and Swarovski jewelry volume pricing. What if I need to return or exchange an item? We're committed to offering high quality products at affordable prices, so if you have a sizing question about our retail items, please contact us at 215.389.1877 or email info@sparkle-plenty.com prior to ordering. If you must return or exchange any item, please carefully pack the unopened and unused item (must be received in a new condition) in the original shipping box, including a copy of your packing slip, and follow these easy steps: 1. Contact us at customerservice@sparkle-plenty.com within 7 (seven) days of receiving your order to let us know you wish to make a return or exchange; returns cannot be accepted without prior authorization. 2. We'll give you a Return Authorization Number (RA#) and the return address. Please make sure that this RA# appears inside the package with your product, so we can make certain your product is received and processed correctly. 3. Send your package Insured Mail via UPS or U.S. Postal Service. We cannot be held responsible for packages lost in transit, so we recommend that you request tracking. We can credit for merchandise only, we cannot credit any outgoing or incoming shipping fees. Sorry, returns cannot be accepted on pierced earrings (for sanitary reasons) and customized items. Please note: Since all shirts are made to order, we can only accept ONE exchange or return per item. How should I care for Rhodium jewelry? Here are some tips for keeping your rhodium plated jewelry looking its best: Do not use any abrasive cloths for polishing and no chemical cleaners. Clean only with mild soap and water, but dry after -- do not wear while bathing or swimming. Enjoy the beauty of rhodium plated jewelry, an affordable way to capture the platinum appeal! RUSH ORDERS: Please call us at (215) 389-1877 or EMAIL US (info@sparkle-plenty.com) to check on availability and shipping rates. Thank you for taking the time to glance at our Terms & Conditions (a.k.a. "legal stuff"). Please read the following terms and conditions relating to your use of our website. By using our website, you agree to these Terms and Conditions of Use ("Terms & Conditions"). We reserve the right, in our sole discretion, to change, modify, add or remove portions of these Terms & Conditions at any time. By using this website after we post any changes to these Terms & Conditions, you agree to accept those changes, whether or not you have reviewed them. If you do not agree to these Terms & Conditions, you should not use our website. Limitation of Liability Neither Sparkle Plenty Designs, Inc. nor any other party involved in creating, producing, or delivering this website shall be liable for any direct, special, incidental, consequential or indirect damages resulting from your access to, use of, or inability to use the website and content. All information offered by Sparkle Plenty Designs, Inc. is to be used for informational purposes only. This website may include technical inaccuracies, typographical errors or information that is incomplete. Sparkle Plenty Designs, Inc. provides this site and its contents on an 'AS-IS' basis, and makes no representations or warranties of any kind, express or implied with respect to the operation of the site. The information, content, materials and products included on this site, prices and availability information is subject to change without notice. Sparkle Plenty Designs, Inc. will not be liable for any damages of any kind arising out of, or in connection with, the use of this website, or products offered on this website. Sparkle Plenty Designs, Inc. will not be liable for any direct, indirect, special, punitive, incidental, exemplary or consequential damages, or any damages whatsoever, whether in an action under contract, negligence, or any other theory, arising out of or in connection with the use, inability to use, or performance of the information, services, products, and materials available from this site. If you disagree with these terms, please do not use this website. Although Sparkle Plenty Designs, Inc. strives to maintain accurate, up-to-date information, photographs or graphic representations of product may not represent actual product packaging and/or color. Further, product color represented on this website may differ from actual product color dependent upon brightness, contrast and color control of the individual monitors used to view the site. You may electronically copy and print to hard copy portions of our site for the sole purpose of using materials it contains for informational, non-commercial, personal use only. Any other use of the materials in this site,including any commercial use, reproduction for purposes other than described above, modification, distribution, republication, or display - without the prior written permission of Sparkle Plenty Designs, Inc. is strictly prohibited. Sparkle Plenty Designs, Inc. and any product or service names, slogans, page headers, custom graphics, button icons, and scripts contained in our site are either trademarks or registered trademarks of Sparkle Plenty Designs, Inc. or its licensors. Such trademarks may not be copied, imitated or used, in whole or in part, without the prior written permission of Sparkle Plenty Designs, Inc. All other trademarks, registered trademarks, product names and company names or logos mentioned herein are the property of their respective owners and may not be used without prior written permission.